I had to work on Memorial Day, and was unpleasantly surprised to find that my ever-reliable New York City wasn’t feeling especially cooperative down by the office. Most of the vendors were closed. Granted, I can’t say I was especially surprised, but generally a deli or two might be open. On Memorial Day, guess again. Down near Hudson Street, the one open shop was a Dunkin’ Donuts. Ergo, breakfast. 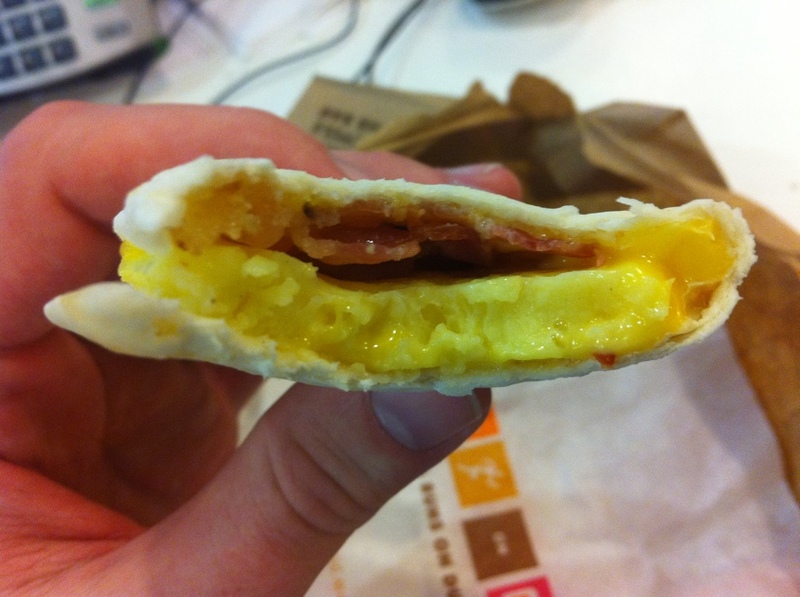 They offered something called a breakfast wrap with egg and cheese for .99 cents. Adding bacon or sausage would bring the price up to $1.29. They were also half the calories (and less than half the price) of their other eggy offerings, so I figured what the heck, let’s give them a run. I ordered two of them. 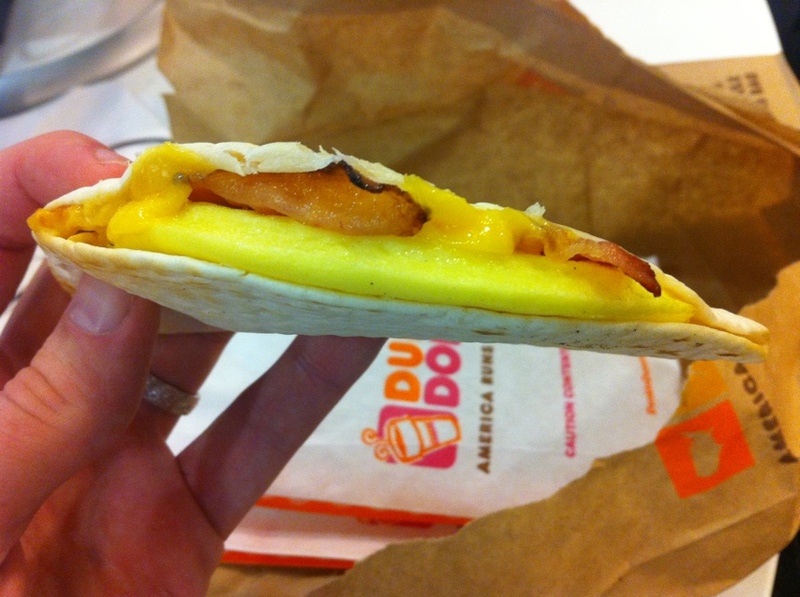 Now I know, what should I expect from a Dunkin’ Donuts? I understand that they sell donuts. I know its unlikely they’d have fresh eggs. But perhaps they had someone grilling ’em up? Nope. The woman behind the counter reached into the cold storage lockers, and produced a semi-circular, fluffy yellow patty. She pulled out a flour tortilla, a piece of American cheese, and a strip of pre-cooked bacon. There was a precise method to the assembly. First, she put down the perfectly round tortilla. Then on went the square piece of cheese. Then the strip of bacon. Then the half-moon of the fluffy, yellow patty. At this point, she folded the tortilla over, and pressed down hard. Then she placed a mesh grid over them, and stuck them into what I took to be her industrial microwave. Is that Yellow #5 I see? 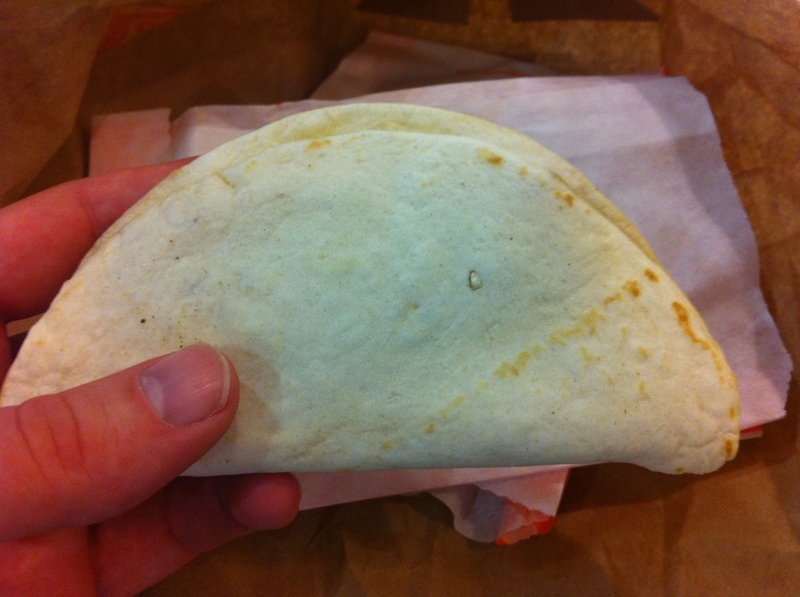 Why is the patty crescent shaped? So that when final assembly is complete, it matches perfectly the rim of the tortilla. 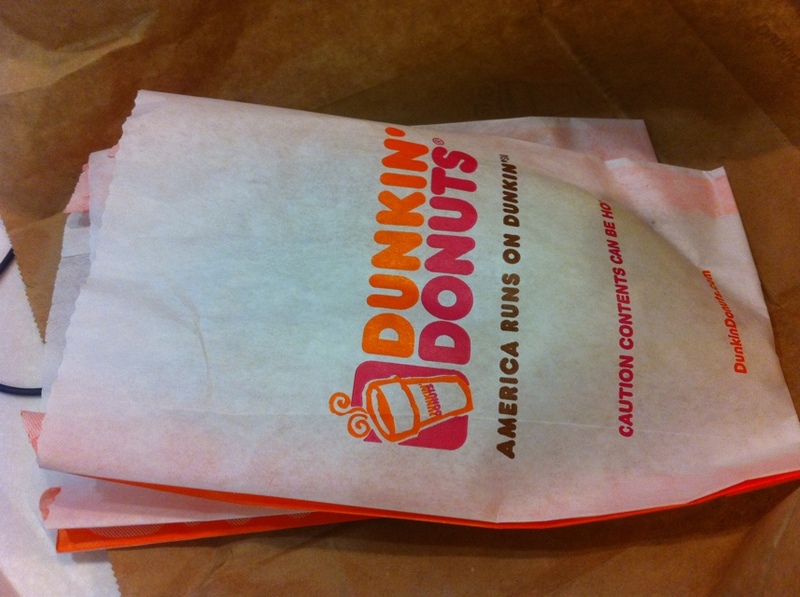 I can see that Mark, before building Yankee Stadium, spent some time at Dunkin’ Donuts corporate HQ. I’m not sure what the patty is. Can eggs be cooked, molded, and shipped on an industrial scale? Refrigerated? Retain their fluffiness through all of that? I was so unsure of what the substance was that I was eating that I logged on to the Dunkin’ Donuts website and went digging through their nutritional information to find out. But there’s nothing there about it NOT being egg, and they continually call it egg, so I imagine they’ve figured out some way to make it perform to the level of trained seal (the circus animal, not the fellows who gunned down Bin Laden). I hate to think of how they have achieved this, it seems inconceivable it’s merely a matter of molding, cooking and shipping it. Maybe there’s a freezing process in there somewhere? Do they use some product to help it survive? I’ll say this, after the nuking (or ovening) the wrap itself was faintly crispy, the bacon was quite hot and salty, the cheese what you’d expect, leaving only the fluffy yellow patty which I really didn’t want to think too much about. It looked like breakfast, its flavor evoked breakfast, and it was very inexpensive. If you like airplane food, you’re going to love this.